In order to setup a Vanity URL in Operate (learn more) you will need to configure a CNAME that points to the correct URL. This guide will take you through the steps required to configure your DNS record for the vanity domain as a CNAME. Sign in to your DNS hosting provider Control Panel. This may be the registrar of your domain, if you haven’t changed it. Look for the option to change DNS records. Locate the CNAME records for your domain. If you don't have a CNAME record for your subdomain yet, look for an option to Add a new record. 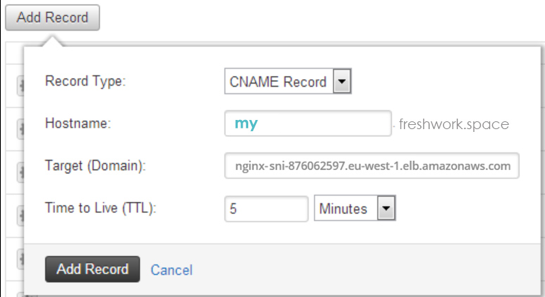 If you already have a CNAME record for your subdomain, look for an option to Edit the record.